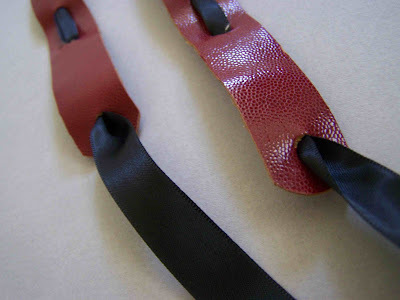 Alright, this is the third and final chapter of the DIY Faux Leather Belts, I promise. I am not going to go through and do a thorough tutorial, because frankly, I think that most of it is pretty self explanatory. If you have any questions just let me know. 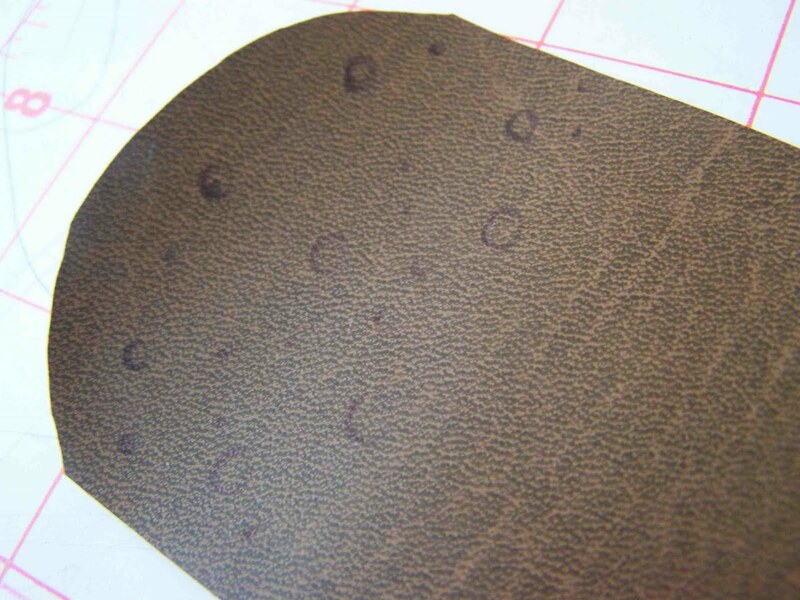 As I was working with this material I remembered that I had a leather hold punch set. I had purchased it for book binding, and had stashed it away. I pulled it out and started imagining what I could do with it. Initially I was thinking that it would be rather handy to add belt holes (which it is), but then I came up with a couple of additional uses. Notice the cutting mat, it is a must. Now there are a number of different types of leather punches. Mine happens to be a more basic model. It has interchangeable heads for punches of different sizes. 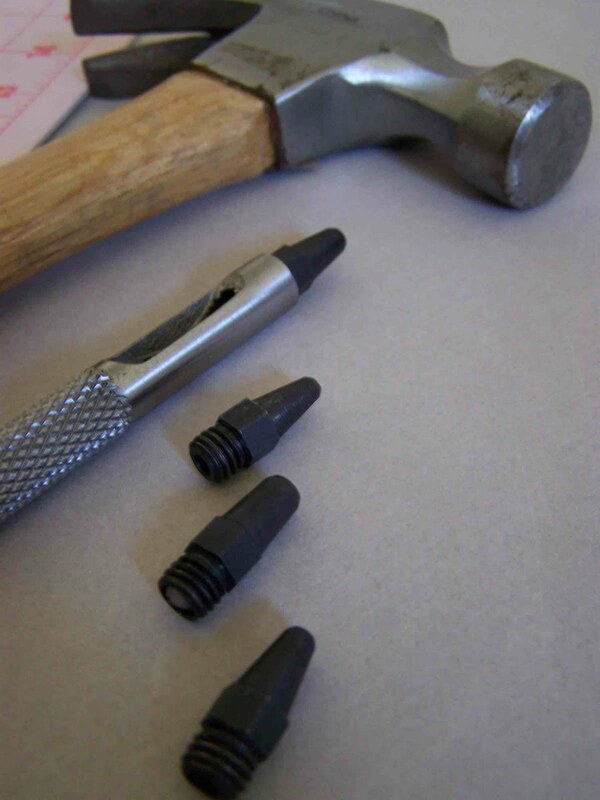 You simply select the size you'd like, place it on top of your material, and use a hammer to cut through the material. 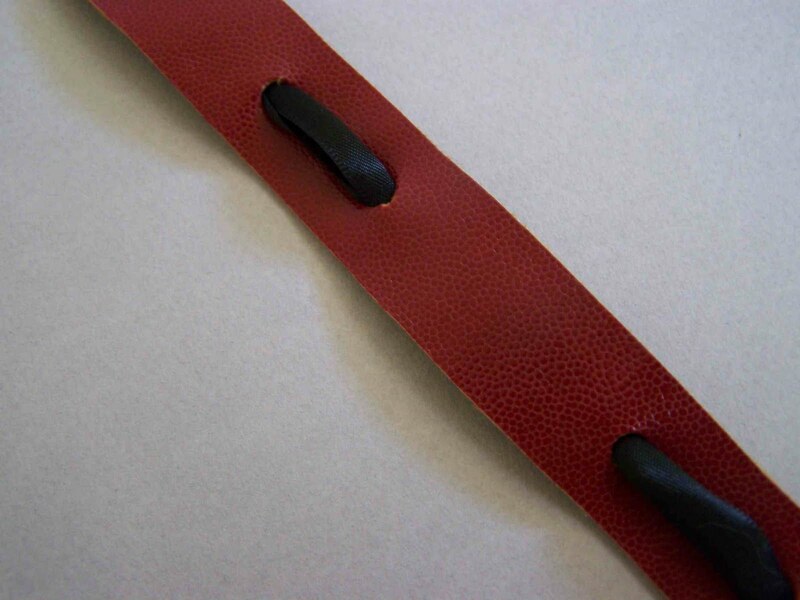 Disclaimer: when using my leather punch I always have to have it on a hard surface (like the kitchen floor), and I have to have a protective layer (such as a cutting mat or cutting board). I usually have to give it about 7 or 8 good whacks with the hammer and a couple of twists and the punch is made. One idea was to make a thin "leather" belt with ribbon laced through out it. I cut out a piece from my red material. I cut it so that the ends almost met around my waist, rounded the ends of the material, and began punching holes. I punched one hole on either end of the belt about 1/2" in. I then made a series of punches along the belt. I left 2" between each set of holes that were 1/2" apart. The sets of holes were where the ribbon was exposed on the outside of the belt. I added a bit of fray check to the end of my ribbons so that they wouldn't fray, and I was done. I left about 10" of ribbon on either end of the belt for tying. 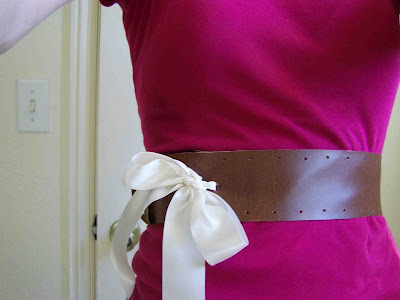 If you like the look of this belt, but don't have a leather punch available, you could always use an x-acto knife or pair of sharp scissors to cut slits in your material. The other belt that I made with the punch set is a wider and slightly more decorative belt. This belt I intended to have some overlap (unlike the red belt). I cut it about 4" wide and long enough to wrap around my waist with about 5" of overlap. I wanted to make a decorative pattern at the end of the belt similar to what you might find on a pair of wingtip shoes. 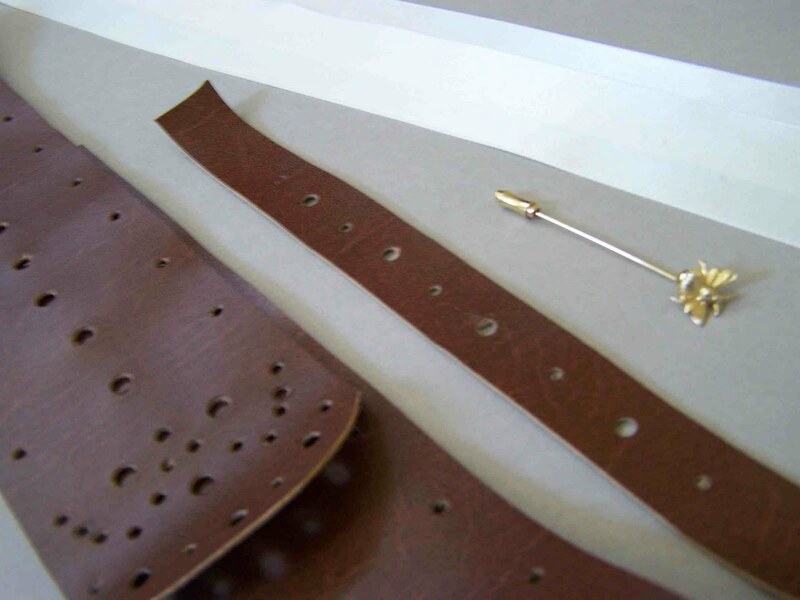 I marked my pattern onto the end of the belt, and using a variety of different sized punches made the holes. I also added a simple punched pattern on the loop of the belt and around the edges of the belt itself. I love how you can catch a peek-a-boo of color when the belt is layered over a top. I made belt holes on both the top and bottom overlapped material. That way I could lace ribbon through the holes and tie it in a bow or a knot. 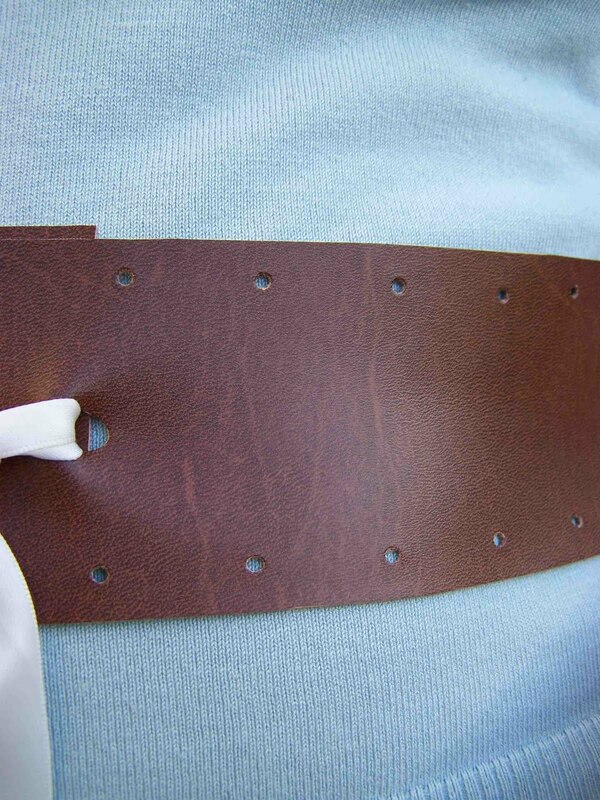 I positioned the holes close enough together that I could also use a standard sized pin or brooch to fasten the belt. I'm still working on my bow tying skills, but I am sure it will come with time. 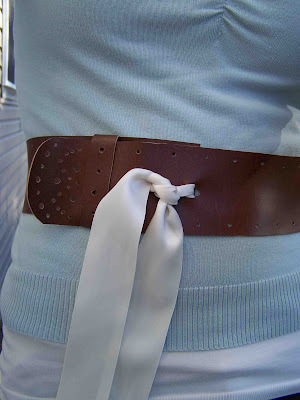 These are quick and easy belts to make, and they don't require any sewing. I used satin ribbon for the ties, but you could use anything that you have on hand. Okay, I promise that I won't pop in with anymore belt posts for awhile, but you might see a bit more faux leather in the future-I have to use up the scraps. Looking for a leather punch? Here are a number of available leather punches. Check out where I'm partying today-I love a good link party. Are you kidding me!! This is truly fabulous!! I love belts and these are just amazing! Great job, sweets and thank you so much for linking this up to my party at Frou Frou Decor!! Have a great weekend!! Um, awesome! Wish I had a leather punch set! They look amazing! really cool!!! come on over and link up to MMM! Love the idea of fastening it with a broach, too! Very cool! MY blog is all about YOU! 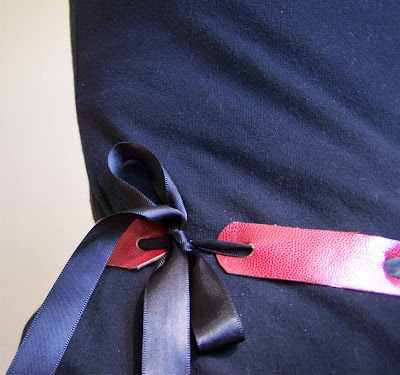 This is really cool - I've had a ribbon style belt sitting on the back burner for a few months now and haven't had time to work it out. Great job! All of your belts turned out so cute, I really liked the wide brown one. Thanks for sharing! This is surely an attractive blog. Thanks for a blog that is really described an amazing thought on Mens leather Belt. Mens wear have various types when your career is in fashion you need to dress fancy and stylish and update to latest trend. Belts for Men / Men’s Casual Belts / Leather Belts Online are the common outfit used in fashion modelling. Great and amazing blog. Thanks.